Have we forgotten God's grace to Israel? 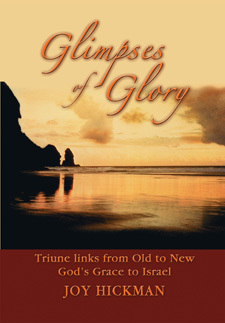 This book is an adventure of discovery that provides insights into the wonder of our Triune God leading from Old to New Testaments, and takes in the highlights of Messianic prophecy. Includes a fresh look at the book of Romans. Joy Hickman tells how she was led unexpectedly to share a message of grace for Israel today, and about relevant ways of expressing the beauty of that message. Prepare to be challenged on your understanding of God's unfailing grace and His special plan for His people. "...I loved [Joy's] emphasis on grace and [her] fascinating suggestions about the structure of Romans and the Jewish festivals." "I am so grateful for Glimpses of Glory. I've begun reading it and I'm really enjoying it." Copyright © 2010 Castle Publishing Ltd.